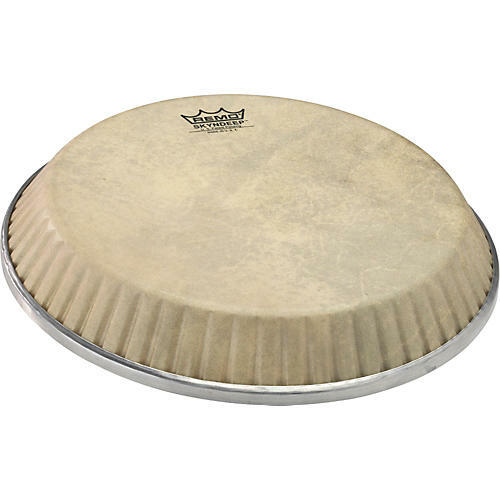 Open Box Remo Crimplock Symmetry Skyndeep D4 Conga Drumhead Calfskin Graphic 11.75 in. Remo Skyndeep graphic drumhead are made using a proprietary ink embedding process into the film while maintaining the integrity of a great sounding drumhead with warm, crisp, vibrant tones. Crimplock Symmetry was created to add flexibility in Remo's manufacturing while increasing available drumhead dimensions. This means, Crimplock Symmetry drumheads can fit more conga drum models from the various drum manufacturers in the industry. With Remo's advanced drumhead technologies and input from the best percussionists in the world, Remo has improved the sound and feel of drumheads. Remo synthetic drumheads provide easy tunability, durability, and playability-giving the world's top players the tools they need to play their music. Designed to fit LP, Pearl, Gon Bops, Toca, and Meinl drums.